A fascinating discovery was made recently about the special bond that mother dolphins create with their babies while they’re still in the womb. The aquarium staff at Six Flags Discovery Park in California started noticing that Bella, a pregnant bottlenose dolphin, was already sending out her “baby whistle” as she swam alone in the tank. It seemed Bella was talking to herself . . . or was she? Once the baby dolphin was born, Bella continued her baby whistle, and the little one responded right away by coming to her side. It became clear that the prebirth baby whistle was Bella’s way of teaching her baby to recognize her voice so that she could call to it immediately, protecting the vulnerable baby right from the moment of its birth. 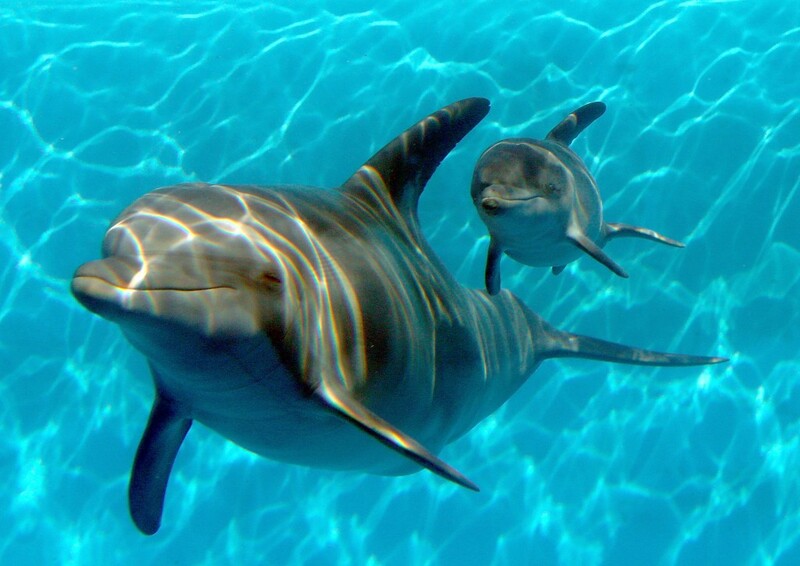 Dolphins understand something innately that many of us in our culture are just coming around to: A baby in the womb in the last trimester can hear what’s going on in the world outside, and the opportunities for bonding before birth are countless. Pretty exciting, isn’t it? Bella’s story illustrates how very natural it is to connect with our expected little one, and what better way to do that than by beginning a reading routine that, like Bella’s baby whistle, will be recognized and responded to by your baby at birth? You can actually begin a bedtime-story ritual during your last trimester that will condition your newborn to quiet down, settle in, and get sleepy. A simple, beautiful, rhyming and rhythmic story, read in your familiar voice, is just what is needed to regulate your baby’s alpha waves, slow his breathing and pulse, and get him primed for tuck-in time. Begin this special bedtime routine now, while your baby is still curled up inside you, and you’ll reap the benefits when he is born. Research shows that having a regular bedtime helps babies to become conditioned to fall asleep each night, so set a regular time to slow your day down and read to your expected little one. Get cozy, relaxed, and comfortable and your baby will, too. Read in your regular voice (your baby has the best seat in the house) and know that you are establishing a beautiful and natural routine that will enrich, nurture, and support your child’s well-being in so many ways. If you’re considering using an e-book for bedtime reading with a child, well, research says that it just won’t do. According to a recent National Literacy Trust study, children who engage with e-books have less engagement with a story and are less likely to grow up to be readers. Turns out that a story on a tablet is perceived by children, especially young ones, as more of a gaming than a reading experience. Additional research says that the screen time before bed interacts negatively with brain waves, getting them wound up instead of quieted down to alpha. Not exactly an effective way to get your child settled down to sleep. Of course, those who love reading know there’s nothing like a real, holdable paper book. When you read a real book with your newborn, turning the pages and looking at the bright illustrations, you will get his visual as well as his auditory attention. You’ll also be setting him up with those prereading skills we’ve mentioned in earlier blogs, such as holding a book right-side-up and reading from left to right. If you want the very best reading experience, and the most natural one for your baby before and after birth, there’s no substitute for the real thing. By establishing a quiet bedtime routine now, centered around your loving voice and a beautiful storybook, you will be delighted to find that you have a child who looks forward to winding down at bedtime, and whose biorhythms will be accustomed to settling down as he snuggles in at the same time each night. So let’s get back to Bella, our dolphin. She knows how natural it is to talk to her baby in the womb—nothing fancy required, just her voice and her desire to connect with her little one. Your own perfectly natural instinct to communicate and bond with your baby can be reinforced by establishing a routine centered around literacy and language, right from the beginning. Research says that both babies in the womb and newborns respond to and learn best from text that is rhyming and rhythmic, and also that the baby knows your voice best. So your voice, plus a beautiful book, is the recipe for a natural language bond. We have just the thing . . . Previous postAnd it feels so sweet . . .
Next postTo let you know . . .